Investments sometimes lose value. And when those investments sit inside an individual retirement account, the losses can seem perplexing. The main benefit of an IRA is your savings grow tax-deferred. Having a deferral when your investments are growing is a smart tax strategy. But what about when your investments are declining? Can you get a tax break if your IRA loses money in the markets? 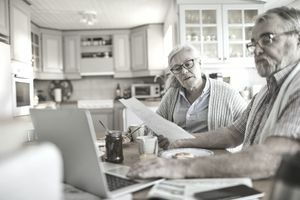 Individual retirement accounts are structured so that any tax impact is deferred until money is actually withdrawn from the IRA in what's called a distribution. When a distribution is made, that's when any tax treatment could be determined. You can take a loss on IRA plans, but only if you cash out all IRAs of the same type. That means: cashing out all your traditional IRAs or cashing out all your Roth IRAs. For traditional IRAs, this loss provision works only if you have a basis from nondeductible contributions. Basis means there were nondeductible amounts contributed to a traditional IRA. If there's no basis, then there will not be a loss that you can deduct on your tax return. However, you cannot cash out only your nondeductible IRAs. All traditional IRA funds must be liquidated to obtain the loss deduction. For additional information, see Publication 590, chapter 1 and drill down to the section on "Recognizing Losses on Traditional IRA Investments." The loss provision works better with Roth IRAs since there's a basis for your original contributions. Any loss would be a miscellaneous itemized deduction subject to the 2% of AGI threshold limit. If the value of the Roth IRA has dropped below your total contributions, then the entire value of the account can be cashed out and you can take a deduction for the loss, and the distribution will not be subject to the early distribution penalty. This is provided for in the Treasury Regulations section 1.408A-6, especially Q&A numbers 4 and 5. If the Roth IRA has lost value, but its value is not below the total amount of contributions, then there won't be a loss for tax reporting purposes. In this case, it would be better to maintain the tax-deferral on the gains you already have. For more details see Publication 590, chapter 2, and drill down to the section on "Recognizing Losses on Investments." IRA losses are a miscellaneous itemized deduction subject to the 2% of AGI limitation. These losses are reported on Schedule A. To get the benefit of the deduction, your loss will need to exceed 2% of your adjusted gross income, and you will need to be able to itemize. Miscellaneous deductions can be adjusted out by the alternative minimum tax, which may further erode the tax benefit of claiming the loss. Once assets are removed from a retirement account, they are removed permanently. You'll only be able to contribute new funds. IRA investors will want to take a look at their long-term asset allocation goals, along with any earnings projections. Any earnings, interest, dividends, gains inside the IRA plan will be tax-deferred (or tax-free if it's a Roth). This allows for your earnings to compound without annual tax payments. The idea here is to preserve the tax-deferral as long as possible to allow your earnings to accumulate faster than they might in a taxable brokerage account. However, some IRA account-holders may not want to re-invest. Instead, they would rather pull the money out for non-investment purposes such as buying a house, paying for medical expenses, starting a business, or for living expenses. While in general, I recommend trying to maintain the deferral as long as possible, it may be necessary to consider a strategy for early distributions. If a taxpayer has short-term cash needs, I would look first at taking a loan against your 401(k) before even considering an IRA distribution, since with a 401(k) you'll be lending to yourself, and the interest would go back inside your 401(k) plan. That's the overall picture. What will work best for you depends largely on your specific investment and financial goals, coupled with a tax strategy that makes an IRA loss as least costly as possible.